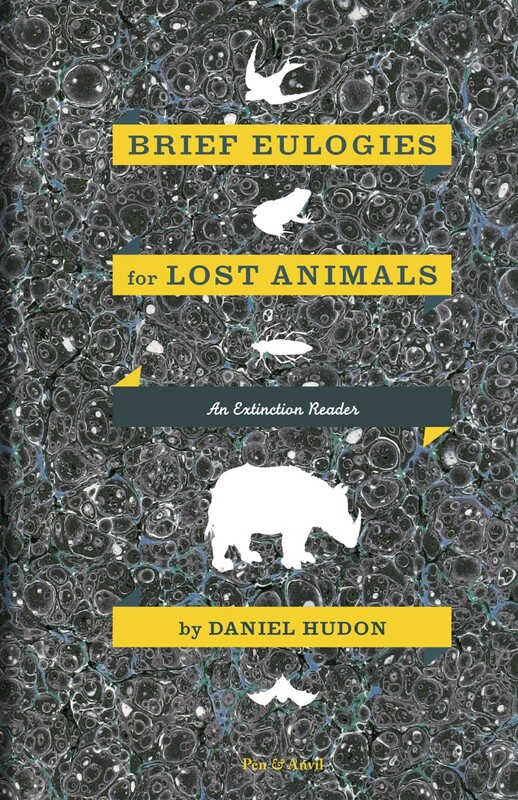 Review of Brief Eulogies for Lost Animals by Daniel Hudon (Pen and Anvil Press, 2017), 137 pgs., $9.67. I had the pleasure of publishing a few of the prose poems from Daniel Hudon’s new collection Brief Eulogies for Lost Animals (Pen and Anvil Press, 2017) a few years ago in an anthology entitled [Ex]tinguished and [Ex]tinct (Twelve Winters Press, 2014). My goal with the anthology was to capture and give life back to people, animals, and things—animate and inanimate—in order to showcase what happens when we, as a species, don’t question what is obsolesced by our human progress. In his new collection, Hudon does just that and acts as a conduit for the voices of lost animals—from all over the world—who have already taken their last breath. Hudon’s direct and unembellished writing style provides narrative clarity in the prose poem format he has selected for all 112 eulogies. His emotional and empathetic portrayal of the animals allows us to experience loss and grief in their fullness. He does a beautiful job of describing the movements of each extinct animal as if he had been there as witness and as an omniscient presence aware of the fate that awaits each animal. The briefest eulogy in the volume is “The Twenty-Four Rayed Sunstar” whose life is preserved in a state of present-tense action: “Shining on the sea floor like a dazzling yellow sun with twenty four arms ablaze.” Hudon lets us see the creatures vividly before writing the truth we know is coming—their inevitable extinction. The failure and ignominious destruction wrought by capitalism, the military industrial complex, and the exploitation of natural resources comes across most clearly when eulogizing the lost animals of North America. When describing the “Gull Island Vole,” Hudon writes of their disappearance in 1898, “when the US government built Fort Michie on the [Gull] island and covered much of it with cement.” In recounting “The Maryland Darter,” Hudon bears witness to how they “struggled against damming, increased sedimentation, and urbanization.” When lamenting “The Monarchs of French Polynesia,” Hudon shows how our eagerness to develop has superseded our ability to properly plan for what the altered states of development may bring: “By the time humans arrive, the forest is but a roadblock to development. And, after the rats arrive, the monarch goes silent.” Thus it’s not just humans who are responsible for the killing off of such beautiful creatures and music, but the systems that humans create. These eulogies point out a fundamental quality of our global economic system: one only succeeds with the forced sacrifice of another. Throughout this collection a discerning reader can’t help but read each eulogy as a warning and a mirror for our own behavior as humans. Take for instance “The Carolina Parakeet” whose “tragic habits…[were] for the flock to sweep repeatedly around a wounded or dead companion, squawking and screeching until they fell to the hunter.” The poems in this volume suggest that it’s this survival-of-the-fittest, apex predator mentality that is hurting humans as a species the most. Soon the damage that we have wrought will return to hunt us and threaten us with human extinction; as we try to mourn our loved ones, we, too, will be picked off. If we don’t change our ways soon, surely we, too, will end up like “The Amistad Gambusia,” “whose name comes from a Cuban term gambusino, which means to signify nothing.” Hudon’s book is a glimpse into our own future. The irony is that in our future there won’t be anyone around to eulogize us; therefore, we will quite literally signify nothing. Hudon’s collection is a concrete reminder of the irreparable damage we have done to the earth. His visceral portrayal of animals’ habitats, their movements, the beauty they once gave to this world, and the sudden ripping away of these things into oblivion and silence is meant to create in us an immediacy that will teach us to cherish and appreciate what we still have in this lifetime. In 1923, Donald Dickey shot the only video of “The Laysan Rail” before it went extinct. Hudon writes of the video: “…it flaps its shorts wings, once, twice, in an effort to catch its mate. If you loop this short clip, the chase goes on forever.” From the lost animals of the Pacific Islands to the lost animals of Europe, Asia, and New Zealand, Hudon provides a platform for these animals to sing their songs one last time from where they reside in silence. And nothing is more tragic or more of a wakeup call—in a long line of wakeup calls—than what Hudon writes in the coda of his extinction reader: “When they gave the roll-call for the animals who were endangered, those who could still be saved, so many didn’t answer when their name was called that a silence set in over the landscape.” The ending of the collection and the sudden, immediate endings of the eulogies double as brutal, heartbreaking reminders for what we have lost and are still at risk of losing. Tennessee Riffleshells and Sampson’s Naiads. that ran through the loblolly pine forests, you could find the Lined Pocketbook. the Scioto Pigtoe took to the Ohio and the Coosa Elktoe to the Coosa. sought the shoals of the Ochlockonee River in Florida and Georgia. in Alabama and Mississippi in 1989, their lustrous interiors still brilliant. As a way to raise awareness about the present biodiversity crisis. I wanted to honor these animals. They were products of millions of years of evolution just like we are and had every right to be here, so I don’t think it’s right that they are unknown and forgotten. What is the biodiversity crisis? Scientists argue that the present extinction rate is 100 to 1,000 times higher than the average rate indicated in the fossil record. The last time the rate was this high was 65 million years ago during the mass extinction event that wiped out the dinosaurs. Because that was the fifth mass extinction, the present crisis is often referred to as the sixth mass extinction. How we handle this says a lot about who we are as a species. What are the causes of the present biodiversity crisis? What are some examples of how these factors have caused extinctions? Two examples are from here in the US. The most endangered animals at the moment are freshwater mussels. They are filter feeders and depend on freely flowing, clear rivers. But over the 20th century, rivers large and small have been dammed and polluted. and suffered from increased sediment loads from soil erosion. Now, 12% of the order of mussels is presumed extinct. In Hawaii—which has the unfortunate distinction of being the extinction capital of the world—one island in particular, Laysan, a tiny coral atoll only a mile across, suffered losses of several birds and even moths when a rabbit farm was introduced. The rabbits gnawed the island down to the sand, and the birds and moths lost their habitat. How did you get started on the project? For a few years, I was part of a team-taught course called Biodiversity: Causes and Consequences at Boston University. I gave two lectures: the fossil evidence for biodiversity and the history of life. Looking at the 3.7 billion years of history of life on Earth, you have milestones like the origin of the cells with a nucleus 2 billion years ago, multi-cellularity 1 billion years ago, and the Cambrian explosion half a billion years ago. The fossil record is sparse before the Cambrian explosion, and much richer afterwards and it marks a time when animals really began to diversify. This remarkable diversification over the last 500 million years is punctuated by five mass extinctions, defined as when more than 75% of species disappear in a short time. To bring the lecture up to date I wanted to discuss how biodiversity was faring, as it were. I had already been to Costa Rica where I found out about the extinct golden toad, and I then I started tuning in to the present extinction crisis. I organized some extra-curricular events around the topic: film showings, guest lectures, a competition to reduce one’s ecological footprint in a week-long “Ecolympics” (though I had to rename it! ), and ultimately, the book grew out of this desire to engage the biodiversity crisis on a broader scale. There are some 900 extinct species since the year 1500 and your book contains entries for 100 of them. How did you choose these? I didn’t want to let the most charismatic species, like mammals and birds, dominate too much of the book. These are the most familiar to us, and for that reason I wanted to uncover some of the less well-known species and tell their stories. I tried to be organized about it and my initial goal was to write the number of stories in proportion to how many extinctions there are for that category of species. There were exceptions. For example, one third of all known extinctions are in the phylum mollusca, but they only get two stories in my book: the Oahu Tree Snails and the Freshwater Mussels of Appalachia. There are similar numbers of extinct mammals and extinct arthropods (the phylum that includes insects, arachnids and crustaceans) but again, because of similarity, many more mammals appear in my book than arthropods. But, arthropods do appear and are not neglected! Beyond that, I tried to find animals where I could actually say something about them. If nothing is known about an animal’s mating habits or behavior, it’s hard to tell its story. What were your biggest challenges in writing the book? Often I was grasping at straws because so little had been written about a species. So I scrounged for anything that I could use to enliven it–a quote from a scientist, a line of poetry, some fact of the animal’s physiology. It was also tough to not get too caught up in the crisis. Sometimes I would just pace around my room and take a shower and run my fingers through my hair as the weight of another loss hit home. The book blends writing styles of natural history, reportage and poetic prose – how did you hit on that combination? In my research, I found two great, oversize books that are thorough in their descriptions and accompanied by beautiful art works (David Day’s “The Doomsday Book of Animals” and Tim Flannery’s “A Gap in Nature”). So I couldn’t just do what they did, nor did I want to. It took me a while to get the title, but I had been thinking that the pieces would be short and elegiac. These animals had a right to be here just as much as we feel we do, so I didn’t want to just describe them, but to honor them in a way that lets us feel their loss. Sometimes I felt I could tell the animal’s story better with a bit of distance, but for many of the lesser-known animals, I wanted to get in close and render them as animate as I could. Do you have favorite extinct animals? The first piece I wrote for the book was the golden toad, so that one’s still dear to me. It used to mate in great orgies, and after a population crash in the 1980’s, fewer and fewer showed up at the appointed time until in 1989, only one lonely toad was seen. I also came to love the Jamaican moth, known as Urania Sloanus, and described as the most beautiful moth in the world. In the book, the piece is based on eyewitness reports, so I hope the dazzle of this moth comes through. I also loved finding out about some peculiar animal habits. The giant tortoises of the Mascarene islands (including the former home of the dodo, Mauritius) would gather in large groups and one tortoise would be apart from the gathering, as a sentry. How on Earth this sentry was to protect the herd from intruders, we’ll never know, but I love the idea of it. Australia’s Lesser Bilby would hide in its burrow on nights of strong winds, heavy rain or full moon. I can imagine it down there, biding its time, waiting. What are some examples of very recent extinctions? In the 21st century, we’ve lost the Pyrenean Ibex, the Yangtze River Dolphin, the Chinese Paddlefish, the Alaotra Grebe, the Po’ouli (Black-faced Honeycreeper) and the Western Black Rhinoceros, and Rabb’s Fringe-limbed Tree Frog, to name a few. Isn’t extinction a natural process? Yes, it is. In the fossil record, species live on average about 2 million years. And more than 99.9% of all species who ever lived are extinct. But the recent extinctions we’re seeing are not caused naturally. Instead, they are human-caused, so we need to be mindful of the heavy footprint we have on our environment. How do you hope readers feel after finishing the book? The overall message of the book is that these animals matter. They do what we do: carve out their niche, search for a mate, take shelter from storms, sleep after a good meal. But the book is meant to be read slowly. My hope is that readers, wherever they are, will not just think about the creatures around them and how their own lives affect those of animals near and far, but also feel a connection to them. 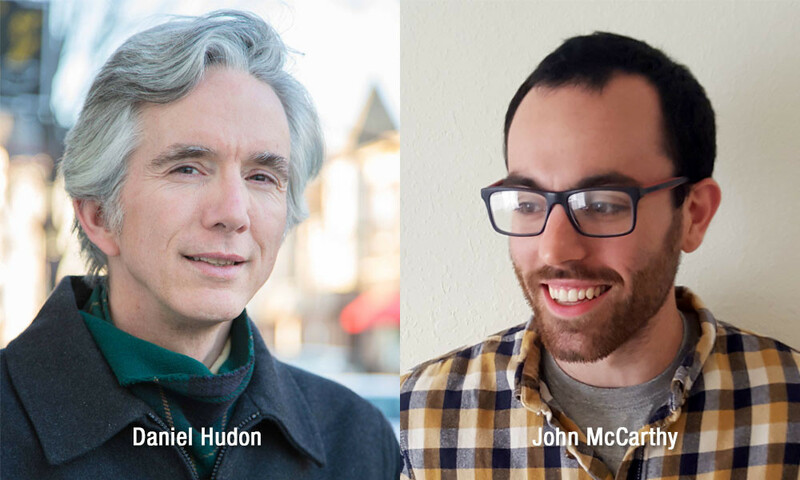 John McCarthy is the author of Ghost County (Midwestern Gothic Press, 2016), which was named a Best Poetry Book of 2016 by The Chicago Review of Books. John is also the editor of [Ex]tinguished and [Ex]tinct: An Anthology of Things that No Longer [Ex]ist (Twelve Winters Press, 2014). His work appears or is forthcoming in Best New Poets 2015, Copper Nickel, Hayden's Ferry Review, Redivider, Sycamore Review, Zone 3, and in anthologies such as New Poetry from the Midwest 2017. He is the 2016 winner of The Pinch Literary Award in Poetry. He received his MFA from Southern Illinois University Carbondale. Daniel Hudon, originally from Canada, is an adjunct lecturer in math, astronomy and physics. He writes nonfiction, fiction and poetry and his new book is "Brief Eulogies for Lost Animals: An Extinction Reader" (Pen and Anvil, Boston). He can be found at danielhudon.com, @daniel_hudon and in Boston, MA.